NEW YORK (WABC) -- The Diocese of Brooklyn will welcome Pope Francis to the New York area with a 225-foot tall billboard in the middle of the Big Apple. Earlier this week, from sunrise to sunset, a team with DeSales Media Group started hand painting a welcoming message at one of New York's busiest intersections, the corner of Eighth Avenue and 34th Street in Manhattan. The corner is conveniently located outside Pennsylvania Station and the iconic Madison Square Garden arena, which will host the Holy Father's September 25th Mass. "This is our way to say 'welcome' and evangelize in the heart of this culturally-diverse city. I am convinced that Pope Francis' apostolic visit will impact everyone, touching hearts across different backgrounds and beliefs," said Monsignor Kieran Harrington, Chairman of DeSales Media Group. 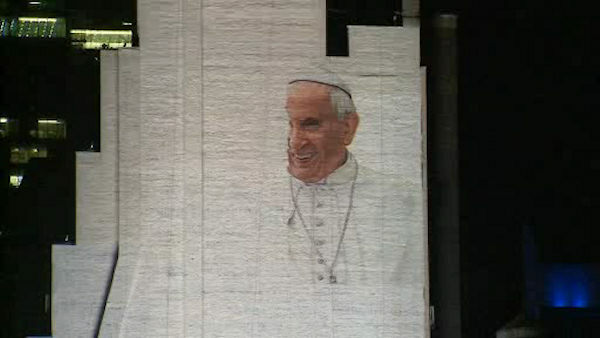 The billboard was designed by Israel Ochoa of DeSales Media and showcases a photo of the Holy Father waving to a crowd, taken by Giulio Napolitano. The image is accompanied by the words Welcome Pope Francis and the public hashtags #PopeInUSA and #PapaEnUSA, inviting people to engage in conversation. The painting process will take up to two weeks and will be fully captured on time-lapse video. For photos of the billboard, as it's being painted, please visit www.desalesmedia.org/popeinusa.